Brother Monkey and I met Mama Monkey and her hubby for dinner last night at our usual halfway point of Rowland Heights. 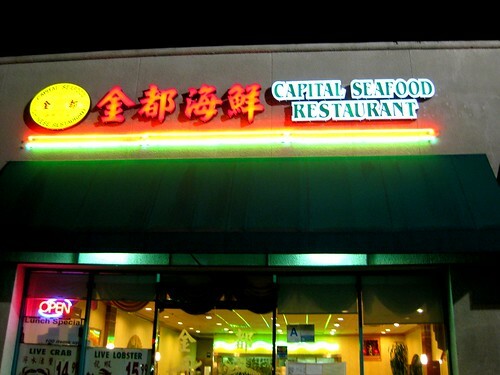 Capital Seafood Restaurant (1015 Nogales Street, Rowland Heights) is one of the better restaurants at the 99 Ranch plaza. It's not much to look at. 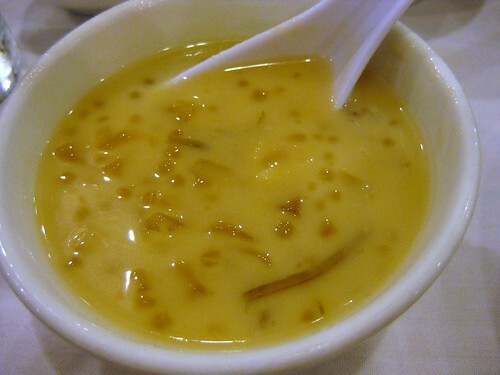 But the Cantonese food is reliable and fast. 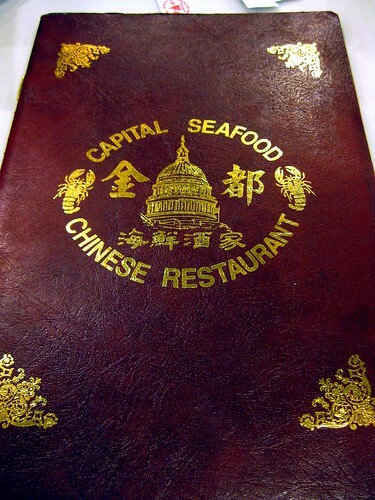 Everything we had was quite tasty and ranged from $8.00 to $13.00, save the crab, which was market price. 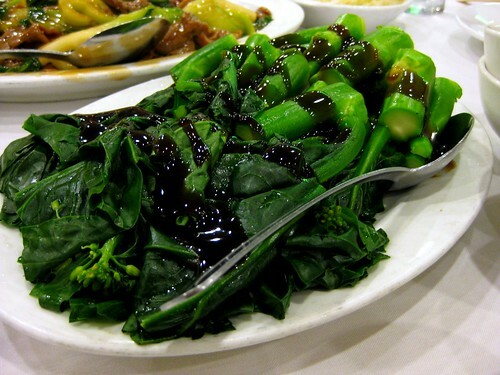 Jie lan with oyster sauce. Fresh and delicious. 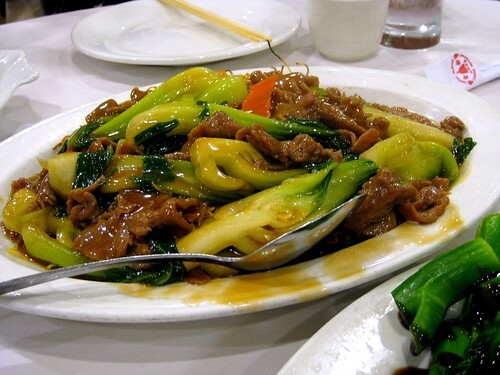 Beef and assorted vegetables over fried noodles. Very good. You can't see the noodles here, but they were golden and great -- partially crunchy, partially soft. 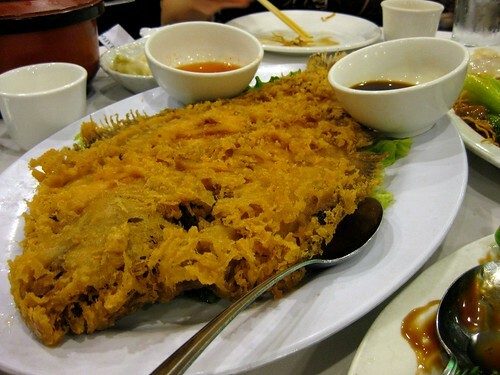 Fried fish. Not sure what kind. Does it matter? You know I liked it. 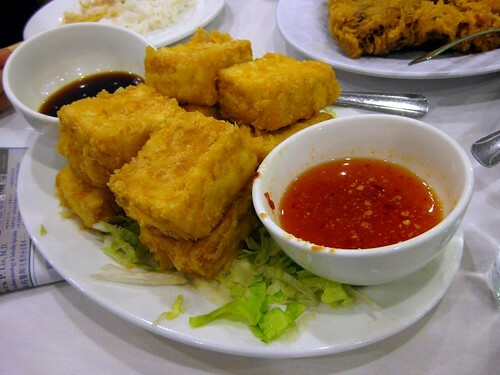 Fried tofu. The outside was lovely, light, and crisp. Always a delight. 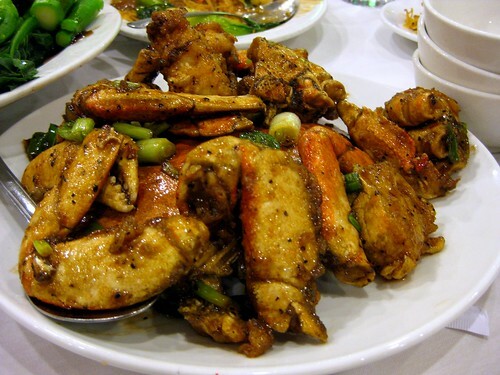 Crab! It was in a tank just minutes before we ate it. Yummy for my tummy. Complimentary hot tapioca dessert. Enjoyable. After dinner, we went into the 99 Ranch plaza for some boba. Lollicup had run out. What? That's like an ice cream truck running out of ice cream. Bizarre. 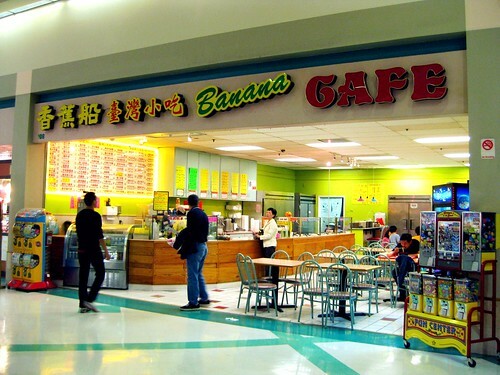 Our runner-up was Banana Cafe, where one of my old SAT prep students used to work (and would give me free boba). Gotta love buy one, get one free. The tea could've been sweeter, but the boba were nice and bouncy. It was fun to see my family. Everyone is doing well! I've been to Lollicup 3 times, and twice they have been out of boba :/ That beef and noodle dish looks yummy. 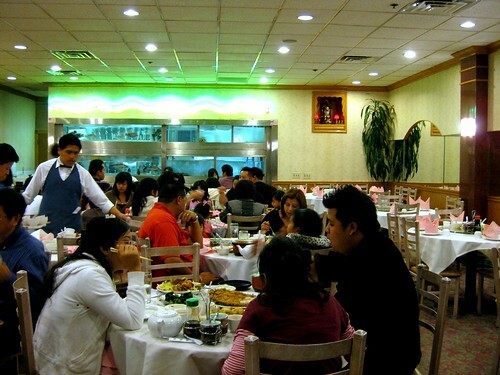 Rowland Heights was the middle point between my parents and us too! We used to go to the veggietarian place (the one next to that weird gift / air freshener / sanrio shop) all the time. Can I interrupt this comment list for an announcement? Speaking of bone marrow, here at the CIA, a coworker's father desperately needs a bone marrow transplant to live. So far, no luck. Obviously, our coworker's heart is breaking. If you aren't already on the list, please consider getting tested and get on the national registry. It's just a cheek swab, and it can save the live of someone's beloved family member. In our coworker's case, they especially need Ashkenazi Jews to get tested, because they are more likely to be a match, but every race, ethnicity, ancestry is needed by someone! Now, back to your regularly scheduled comments. YUM!!!! I don't even like seafood and this all looked amazing anyway! I think it's cute that you guys get together so often. That crab looks so delish! 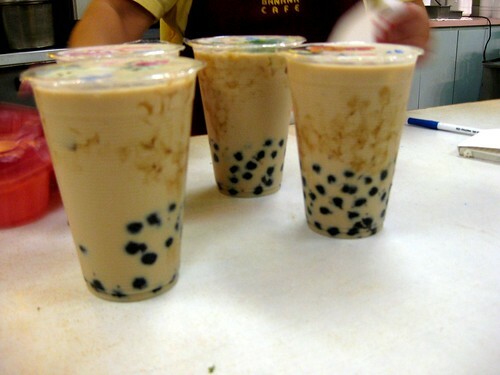 Boba sounds so good right now. Glad you got to see the fam! glad all is well with your family! man, so many good eats near you. seriously, almost every day, i say, "i wanna go eat with weemo!" Don't get me wrong. I still hit it up once a week for lunch fixings, but our 99 Ranch is the weakest one I've ever been to. We only have one boba place, and it's not even a lollicup. mmm, that looks really delish.